Just 25 players remain in the inaugural WPT Devilfish Cup at Dusk Till Dawn. There were 161 entries with the top 20 getting a share of the £1,020,000 prize pool. The winner will get £250,000 along with a special BMG guitar signed by Queen lead guitarist Brian May. 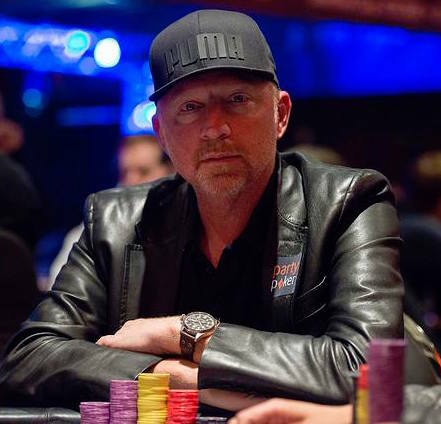 Peter Roche leads; others still in include tennis legend and three-time Wimbledon champion Boris Becker (pictured right), UK veteran Barny Boatman and the UK’s #1 tournament player Sam Trickett (who says he hasn’t played a tourney in over a year). Action will resume at 2 p.m. UK time today. The £5,300 buy-in event includes a £300 donation. All donations, plus 3% of the prize pool, will be split between the Marie Curie charity and a trust fund for Ulliott’s daughter Lucy. The £2,200 Main Event starts today. Last season’s partypoker WPT UK Main Event attracted a field of 450 entries with Iaron Lightbourne beating Craig McCorkell heads-up to win the title and £200,000.